Heloise and her allies are marching on the Imperial Capital. The villagers, the Kipti, and the Red Lords are united only in their loyalty to Heloise, though dissenting voices are many and they are loud. The unstable alliance faces internal conflicts and external strife, yet they’re united in their common goal. 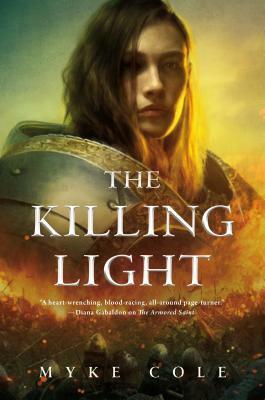 But when the first of the devils start pouring through a rent in the veil between worlds, Heloise must strike a bargain with an unlikely ally, or doom her people to death and her world to ruin. MYKE COLE is a devoted comic fan and voracious fantasy reader who never misses his weekly game night. His fandoms range from Star Wars to military history. He’s a former kendo champion and heavy weapons fighter in the Society for Creative Anachronism. At the D&D table, he always plays paladins. After a career hunting people in the military, police, and intelligence services, Cole put these skills to good use on CBS’s hit show Hunted. Author of the Shadow Ops series and the Sacred Throne Trilogy, which begins with The Armored Saint, Cole lives in Brooklyn, New York.